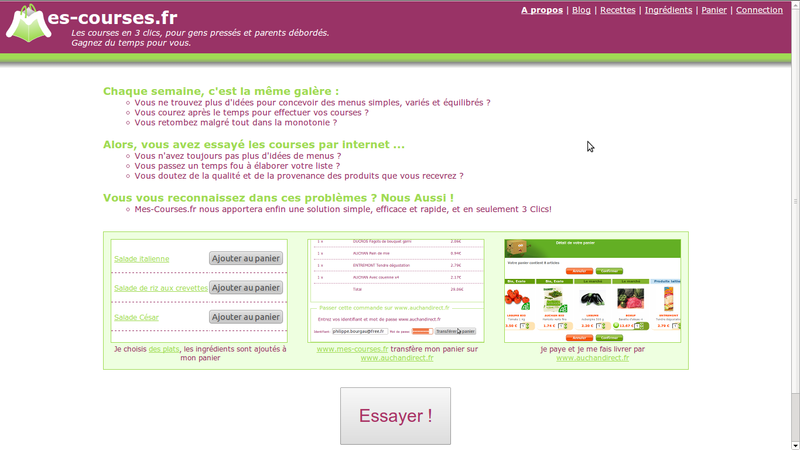 I wanted to create a really fast on-line grocery front-end, where people could shop for the week in only 5 minutes. It supported shopping recipes instead of individual items but I also envisioned to allow automatic menus recommendations, and automatic item preference selection. I started 4 years ago, and this is my last doing on the subject :). If you’re thinking about starting your own side project, this post is for you. Scrapping is a time hog. I won’t start any side project involving scrapping anymore. Automated testing and deployment saved me some time from the start. Especially with the small amount of time that I could spend on my project, it was really easy to forget details and to make mistakes. Choose something that I am passionate about ! I did not manage to get anything done before I settled a regular daily rhythm. I used to work from 5:30am to 7:30am, I first tried in the evening, but after a day’s work, I was too tired to be really productive. It is sure that doing a side project seriously is a heavy time investment, but there’s also a lot of benefits ! Trying to bootstrap a for profit side project is like running a micro company, it’s a good opportunity to understand how a company is ran. This can help you to become a better professional during your day-job. Having control on everything is a good situation to use Lean techniques. Failing allowed me to actually understand Lean Start up ! The ideas are easy to understand in theory, the practice is a very different thing. It should help me for my next project. Resolving real problems on my own was a very good source for valuable blog articles. Next time, I hope I’ll get more euros as well ! You’ve got nothing to loose from trying ! Just do it. Give yourself 1 year to get some small success, and then continue or repeat with something else !